This Free Crochet pattern has gotten an upgrade! I decided to redo the design and film it in HD. This time around I added some retro style to it and at the same time, I got the measurements for baby to king size bed just in case you wanted to make a full-size afghan! I just love how the holes in the granny square leave this diamond pattern running through it and because it’s almost solid clusters it’s very warm. 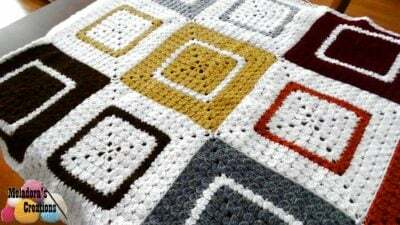 But because it’s granny squares, you can make this afghan any time of the year. Really hope you like it. Happy Crocheting!